“One of the biggest problems in psychology and medicine is that, despite a plethora of tools and techniques, there is still no clear theoretical understanding of why people have psychological symptoms. Yes, in some cases there are biological causes, such as brain damage or toxins – but these by far are the exception, not the rule. Since the 1950s, researchers assumed that symptoms have something to do with bad biochemistry – but attempts to follow up with that model have failed. And failed so thoroughly and for so long that the large drug companies have abandoned research into mental disorders. The latest hypothesis is that disorders are due to damaged neural networks, and again, some interesting work is coming from this, but no breakthroughs have materialized. Since these ideas seem reasonable, we assume that no progress is made because these are just difficult areas to work in. But what if the symptoms are actually caused by something no one had ever thought of? Well, before you start looking for the tinfoil hats, let’s see what would be required for a radically new model. First, it would have to be in agreement with existing experimentally-derived biological principles. (Or if not, be able to identify overlooked, inaccurate, or incorrectly extrapolated observations.) Second, it needs to be able to address all of the data, not just ‘cherry picked’ cases or observations – no ignoring “inconvenient truths”. Third, it needs to be able to treat problems existing techniques either cannot, only do partly, or do with great difficulty. And last, it hopefully explains everything in an elegantly simple way, resolving the confusion in existing data and models. And yes, there is just such a solution, in an area of biology that no one ever associated with psychological symptoms - inside the cell itself. Subcellular psychobiology is a breakthrough in recognizing that psychological symptoms and mental illnesses are directly (or indirectly) caused by damage or disease inside the cell itself. Subcellular psychobiology is an entirely new field of medicine. As far as we know, no one else has yet published in this area. Our first book on subcellular psychobiology (shown above) is a handbook for practicing therapists (now available on Amazon.com). Over the next year, we'll be publishing a number of books exploring specific applications, like suicide, spiritual emergency, addictions, schizophrenia, and other topics. Unfortunately, due to time constraints, we don't plan on publishing a book on in-depth theory until sometime in 2016. This new understanding of the cause of psychological symptoms would be merely an interesting biological curiosity except that it is also possible to intervene directly inside the cells themselves without using drugs or invasive medical procedures. Fortunately, it turns out that psychological-like techniques can be developed that take advantage of the fact that information flows into the cells as well as out of them. In fact, this is how all effective psychological techniques work; just no one realized that they were exploiting subcellular mechanisms to get their effects. Now that the effects of subcellular biology on psychology and medicine is recognized, a whole new generation of healing techniques becomes possible - ones never even imagined before. For example, it turns out that many mental disorders of unknown etiology are actually caused by diseases inside the cells themselves. It is now possible to create techniques that directly intervene with the cell to make a person immune to the pathogen that is causing the mental illness. For example, the Institute's treatment for schizophrenic voices works by making the person's immune system aware that there is a fungal pathogen present, one that indirectly causes the voices. When our 'Silent Mind Technique' is used, the immune system swiftly eliminates the disease along with the voices. For over thirty years biologists and doctors have been trying to understand the biological mechanisms behind placebo effect cures. (Laypeople mistakenly assume that the client only imagines that they heal; but the placebo effect really does cure people, albeit no one understand how this works.) 'Psychoneuroimmunology' was coined to describe this interaction between the mind and the immune system, but very little progress was ever made in understanding or implementing ways to do it successfully. It turns out that this was a subcellular issue, and once this is realized, techniques can be developed that can be used during an office visit with a therapist. As you read this material about subcellular damage, you might wonder how it is possible to heal the billions of cells, or target a particular cell type that has the problem. Fortunately, the solution to this problem was another fundamental biological breakthrough that we call the 'primary cell model'. From a psychological viewpoint, we discovered that consciousness exists in only one singe cell of the body, the primary cell. From a biological viewpoint, it is a totipotent stem cell that acts like a master pattern for the entire body. Repairs to this one cell automatically echo out into all other relevant cells in the body. This is why we can use psychological-like techniques to heal - they automatically interact with the primary cell that then repairs all the other cells. Problems inside the cell are the cause of symptoms, but then the obvious question is "what is the most effective way to heal them?" It turns out that one can develop techniques that interact in the present to heal the cell interior. One can also use regression or other trauma techniques to repair biographical and generational problems in the past; this results in the primary cell repairing itself when these influences vanish. Thus, when we think about healing, we have two sides of the same coin - one side is the past (developmental trauma), the other side is the present (the subcellular interior). Developmental psychobiology looks at early stages of growth, both from the perspective of biology and from the perspective of experiential regression therapies. Using regression techniques, such as our own Whole-Hearted Healing, people can remember and relive those very early developmental stages for both investigation and healing. Subcellular psychobiology, on the other hand, studies how subcellular structures and diseases inside the cell affect our psychological and physical symptoms and experiences in the present. For example, our Peak States Therapy is actually a collection of subcellular psychobiology techniques. With them, we can interact with subcellular structures and pathogens in the present. These two approaches work synergistically together in the area of immunology: the subcellular approach allows us to find the cause of a disease symptom inside the cell; the developmental approach allows us to identify, out of a myriad of possible traumas, exactly which ones need to be addressed and healed in order to eliminate that subcellular problem. Our Institute's focus on subcellular biology came about when we realized that optimized metabolic pathways and other subcellular functions, if working properly, were experienced psychologically as peak states of consciousness. This understanding has led to entirely new ways of bringing clients to various stable, permanent peak states of consciousness. One of the most important applications of subcellular biology is in the area of trauma and PTSD. We normally assume that trauma experiences with their painful content are stored in some kind of neural network in the brain. However, it turns out that this is not the case - trauma is a consequence of subcellular damage to gene histones inside the nucleus. To learn more about this at a layman level, we refer you to our webpage on the biology of trauma. One of the hottest topics in biology today is the study of epigenetic damage. Only in the last decade have biologists realized that one can inherit physical problems from one's ancestors in ways that don't involve damage to the genes. (A fascinating video done by the BBC in 2005 talks about how the epigenetic mechanism was identified.) Currently, it is assumed that epigenetic damage needs to be treated via drugs or other physical interventions, but it turns out that simple psychological-like techniques can also repair the underlying biology. For more detail at a layperson level, see our webpage on the biology of generational trauma. Surprisingly from a conventional view of psychology, research on subcellular psychobiology is extremely dangerous. In our work, five of our research staff have died and all have been injured at one time or another. However, like research into new drugs, once this dangerous research phase is finished, the results of their work can be used safely in the therapist's office; and provide benefits that conventional techniques cannot even begin to approach. For a full discussion of the reasons for these safety issues, we refer you to the Subcellular Psychobiology Diagnosis Handbook. Although the Institute has been researching subcellular biology since 2001, it was not until now (2014) that we felt we understood enough about safety issues to publish our discovery. Hence our new Subcellular Psychobiology Diagnosis Handbook, published in November of 2014, discusses safety extensively. If you are interested in reading about some of the safety and ethical issues involved, we refer you to our article 'Going Public with Subcellular Psychobiology' in our research blog. Fortunately, understanding subcellular psychobiology actually makes clients safer because all effective therapeutic techniques unknowingly interact with the cell - and problems that are accidentally triggered are not recognized or understood, and so cannot be treated. Essentially, it's like having someone work on your car; the certified dealership mechanic will recognize and fix complex problems that might be overlooked or not properly repaired otherwise. It will be many, many years before this new field of subcellular psychobiology will be explored and fully utilized. Some of the implications are truly astounding, and, like computers, over time the applications will continue to evolve and expand. For example, although we are already developing techniques that make people immune to specific diseases, our subcellular models predict that it should be possible to develop techniques that make people globally immune to all bacterial, fungal or viral infections. "Going Public with Subcellular Psychobiology", in the Institute for the Study of Peak States blog (November 2014). The Ghost in your Genes (2005) by the British Broadcasting Corporation. This video does an excellent job of explaining Dr. Pembrey's discovery of generational epigenetic damage via data from families in an isolated town in Sweden. Peak States of Consciousness, Volume 2 (2008) by Dr. Grant McFetridge and Wes Geitz. 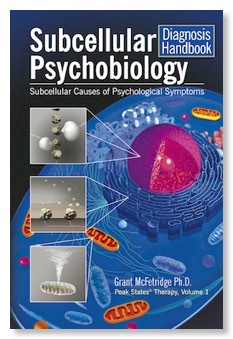 Subcellular Psychobiology Diagnosis Handbook (2014) by Dr. Grant McFetridge. Backcover text; Table of Contents; Search Inside the book (via Amazon). "Understanding 'Pay for Results' for Therapists", an online excerpt of Chapter 3 from the Subcellular Psychobiology Diagnosis Handbook (2014). Nov 12, 2014: First draft of this webpage.